Roman concrete is famous for its durability, lasting for thousands of years and seemingly stronger with each passing year. New research has uncovered the chemical processes responsible for the sturdiness of this ancient building material—a finding that could inspire modern engineers to revive this forgotten technique. 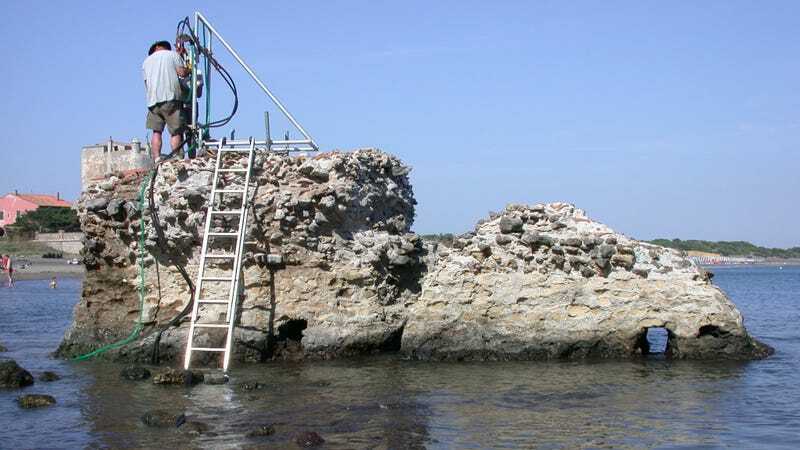 If this news about ancient Roman concrete sounds familiar, it’s probably because you’re remembering work done by the same researchers a few years ago. Back in 2014, a research team led by Marie D. Jackson of the University of California at Berkeley showed how the recipe for Roman concrete—a mixture of volcanic ash, lime, and seawater combined with a volcanic rock aggregate—produced a chemical reaction that resulted in super-strong concrete. Trouble is, Jackson’s team wasn’t entirely sure how the Romans managed to facilitate this complex reaction. In a follow-up study, published this week in American Mineralogist, the researchers have learned that it wasn’t the Romans who facilitated this chemical reaction—at least not directly. Rather, the strengthening process was caused by the steady filtering of corrosive seawater through the concrete over time, which triggered the growth of rare, interlocking minerals that made the material even tougher. Indeed, ancient Roman piers and breakwaters, some of which were constructed more than 2,000 years ago, are thought to be stronger today than when they were first constructed. Modern marine concrete structures, made of rocks or gravel mixed with water and cement, crumble within a few decades. Inspired by naturally-cemented volcanic ash deposits, the Romans learned how to make concrete—and they did so by exploiting the binding powers of what scientists now call a pozzolanic reaction. This reaction, named after the city of Pozzuoli in the Bay of Naples, causes minerals to grow between the aggregate and the mortar, in this case, a mixture of silica oxides and lime found in volcanic ash, which has the happy effect of preventing cracks from growing. Modern concrete also uses rock aggregate, but particles used today are deliberately kept inert to prevent reactions from taking place. Unfortunately, these nonreactive aggregates help cracks to grow and spread, resulting in steady deterioration. As the previous work by Jackson’s team revealed, the presence of a rare mineral in the Roman marine mortar, called aluminous tobermorite, allows mineral crystals to grow around the lime particles via the pozzolanic reaction. But this only happens at relatively high temperatures, so it wasn’t obvious how the Romans managed to achieve this effect. It’s tough for scientists to do this in the lab today, and when it is done, it can only be done in small batches. Convinced that something else was responsible for the effect, the researchers took samples of aluminous tobermorite, and a related mineral known as phillipsite, to Berkeley’s Advanced Light Source lab for x-ray scanning. They found that the aluminous tobermorite formed within pumice particles and pores in the cementing mix, but because it’s not possible to recreate this effect over short timescales without high heat, the researchers figured something else had to be responsible. That something else, concluded the researchers, is the steady pounding of seawater. Instead of eroding the concrete, seawater sifts through the material, dissolving components of the volcanic ash. Over the course of hundreds of years, this allows minerals to grow from the highly alkaline fluids that are leaching out. This results in the proliferation of interlocking, crystal-shaped structures that increase the concrete’s resistance to brittle fracture. To a materials engineer working today, this process would represent a total nightmare. In fact, scientists spend a lot of time trying to prevent this sort of thing from happening in modern materials. So why don’t we do as the Roman’s did? For one, volcanic ash isn’t the most accessible natural resource. But more importantly, we still don’t have the precise recipe used by the Romans to make the concrete, nor do we have access to similar building materials. Jackson and others are currently working on a replacement recipe, and should it be developed, it could be put to good use—including a tidal lagoon that’s slated to be built in Swansea, United Kingdom. This structure, which will be used to harness tidal power, will need to operate for 120 years in order for the construction costs to be recouped. “You can imagine that, with the way we build now, it would be a mass of corroding steel by that time,” said Jackson. Instead, using this ancient Roman technique, we could built a structure that would remain intact for centuries.